The silence of the snow was smothering. The large, slow flakes and the mounds of fluffy powder appeared soft, but I only felt the edge of the cold infiltrating my layers, bristling against my contracting skin. My heart was beating so hard I could hear my pulse knocking in my ears. My heaving breaths plumed out in front of me in the dark night air. I could not hide them; I could not contain my own escaping heat. It would find me. It would be able to hear me, to see me. My fingers were trembling against the bark. I had not noticed I was clinging to the trunk of a tree desperately. I caught myself and tried to pry myself from its embrace, but it was just too sturdy, too constant against me. Yet my fingertips shifting against the rough bark made a small sound against the heavy night. A sound it could hear. I was at a loss with my frozen feet shuttering and sunken in the deep tree well beside my wooden pillar of feigned safety. I could feel the weight of the snow pressing down on my boots; I could feel the compound cold of the heaped snow penetrating the fabrics deeper and deeper. The cold was making a home in me, teaching my cells a new and frigid language. Then I heard it, over my own heartbeat, over my own panting breaths, over the thick silence of winter: the slow deliberate compaction, the crunch as the powdered snow was smashed down under weight. Footsteps, slow and in the distance, moving closer. If my heart could have seized in my chest, it would have stopped beating. I felt my entire chest contract, wrapping tightly until concave around the anxiety swelling in my belly. I froze and held the fog of my breath in my lungs until my lips began to quiver. I could not hide in the dark with the way the moon ignited the snow blanketed on the ground and fluttering down through the air. I could not find refuge with the tree trunks and branches barren like skeletal limbs. Any step on the virgin snow would betray me, announce me to its keen ears. It was waiting for me to make such a mistake. The footsteps were getting closer. The methodical puncture of the untouched snow was becoming deafening. I sneaked breaths out of the corner of my mouth and tried to send the curling heat against the trunk of the tree so as not to broadcast it in the contrast against the black air. I could not take it. I could not just wait for it to find me. It was getting too close. My instincts swelled up inside me, reached out into my limbs, pulsing adrenaline through every vein.I shoved my palms against the abrasive tree trunk and began to run without direction. My feet plunged into the soft snow; my legs were swallowed up. 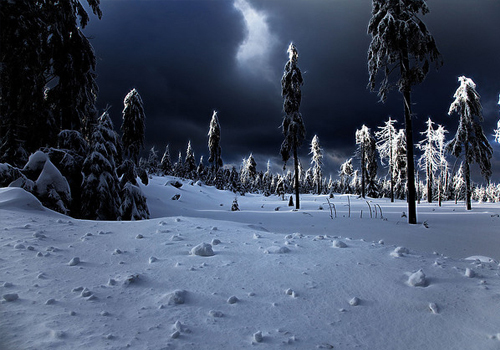 I tumbled forward and clawed at the cold snow, digging my way forward sloppily. I left a cavernous path behind me, leading straight to my pathetic attempt to flee. Steam curled like smoke signals into the night above my position. I was a blur of heaving breaths, scraping hands, and sloppy steps. I was an advertisement for my own demise. And as I broke from the twisted skeletons of the trees into a blank clearing of only windblown snow, it saw me. Our eyes met across the pall radiating from the white world, mine wide and crazed and its red and demonically glowing. 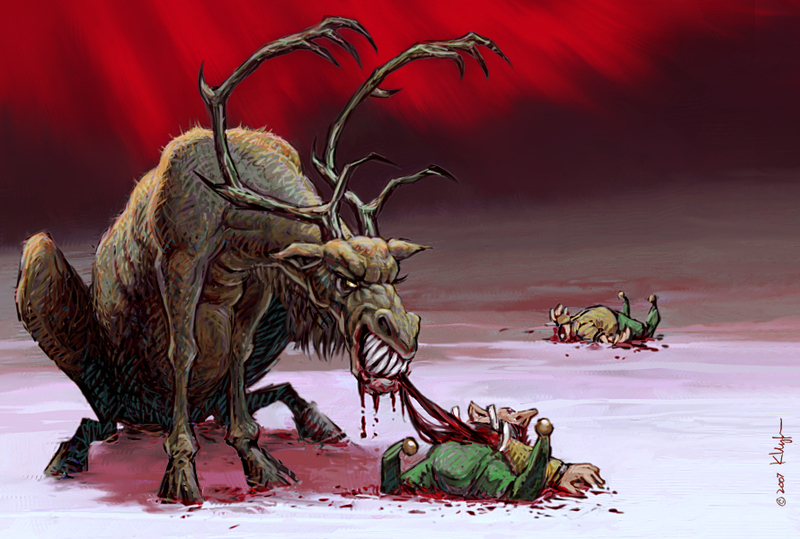 The beast cast a haunting shadow across the glittering snow, broad heaving shoulders, lean and powerful legs, gnarled and pointed antlers. Large puffs of smoke curled around its drooling muzzle and through its sharp rack as it grunted at me rhythmically. Even in just the moonlight, I could see the blood dripping slow and thick from the tips of the antlers. Jacob’s screams behind me as I heard his ribs shatter and collapse, as I hear the air wheeze out of him. I did not stay to watch as I fled to my lonely tree trunk in the dark. It did not need to move; I knew this was the end. I could never outrun the beast in its habitat, as it hunted me so naturally. I looked up into the cold and distant stars then closed my eyes to hear the hoof falls escalate to a gallop towards me. This was a glimpse of winter horror. My book, Savages, paints a picture of apocalyptic horror. What would be the scariest winter horror for you?